Villains are so busy with being all-powerful and trying to conquer the world that they so often completely neglect their physical appearance. We mean, take a look at old He-Who-Must-Not-Be-Named, here. We’re going to need to name a good salon for him to go get a manicure, because those hands are nasty. His long fingernails are a not very healthy-looking dead purple color, and he has weird veins and unnaturally-colored hand skin...come on, man. You're the most powerful dark wizard to walk the face of the Earth. Dumbledore is afraid of you--that’s saying something. The least you could do is cast a spell to give yourself some better and more capable looking hands. Oh well. As long as he's obsessed with ridding the world of Harry Potter, he just probably doesn't care that much about anything else. 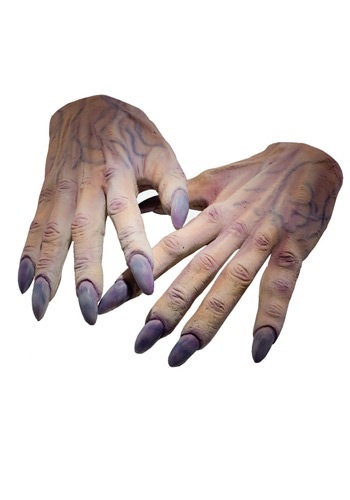 But maybe you’ll care, a lot, about finding these officially licensed Voldemort Hands to accompany your costume this year. Get working on your parseltongue!